Hello everyone…my name is Nicole Goerge. I was introduced to triathlons in 2007 after my son was born. Being completely intimidated by the thought of swimming with others, I started in the sport by doing a few relays and pool sprints for the first few years. It was fun competing with my friends and a great introduction to the fantastic, fun loving people in this community. For many years, I was very happy racing only the sprint distances. I was internally motivated to face the challenge of the courses, improve my time, overcome my fears in the water and have fun. 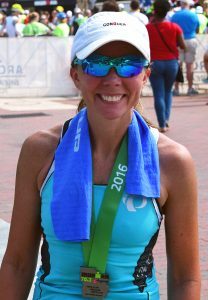 For the last two seasons, I took on the international and 70.3 distances and I am glad to say I conquered my fears and persevered to the finish! When I am not training for triathlons and road races; my time is filled by motivated others to be their best through my personal training business, running around with my active soccer playing son and supporting my husband through all his races. The Kinetic Multisports team is so supportive. We are here to help you along the way and encourage you to succeed. I am proud to be an ambassador for such a wonderful organization. If you ever need help, please let me know. I am happy to talk with you and create a plan to help you exceed your goals!